Cable rows and vertical rows focus somewhat on the middle of the back. Lat pulldowns focus somewh.. 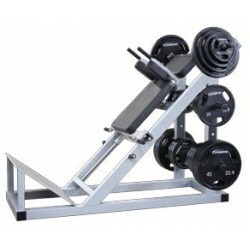 The Legend 3136 Lat/Low Row gives you two machines in the in space of one. Gentlemen, start your .. The American Barbell Sport color bumper plates are 450mm in diameter and feature a quality stainless..
Don't let the compact low-profile design fool you. The Legend 3175 Standing Leg Curl has a lot go..
A common problem with athletic training is the lack of posterior chain development. The glutes an.. This sinister looking device is where powerful linemen are born. Designed from a need for one pie..
You've looked high and low for that one piece. Well, look no further than the Legend Smith Machin.. The American Barbell Sport rubber bumper plates are 450mm in diameter and feature a quality stainles.. The first member of our ground breaking plate-loaded LeverEDGE line, the 6001 Shoulder Press is r..
Walk-through Design Elimination of crossbar allows easy walk-in/workout access and facilitate..
Give your traps the focused burn that they need without letting the workout turn into a series of.. The biggest guys in the gym know that hitting the upper pectorals is key for complete chest worko..